This pre-owned gothic wedding dress features layer upon layer of frothy lace and ruffles. It's been hand dyed to feature black with blue accents. The blue might help soften it up a bit so the bride's elderly relatives won't freak out quite so much that she's getting married in black. 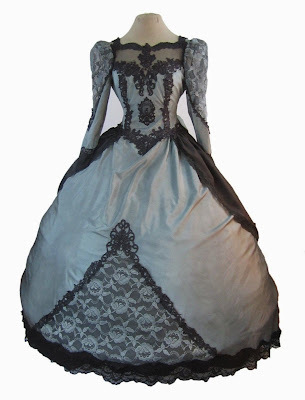 This gothic wedding dress is also pre-owned, and has been hand dyed an icy blue. I love the sparkle on the lace, and check out the embroidered lace train! If you want a more fitted or tailored look, here's a steampunk wedding gown in the same icy blue with black accents. This "vintage steampunk" wedding gown was created by dyeing a vintage wedding gown gray. I don't like the poofy sleeves on this Victorian style ball gown, but I like the ruffles on the train. Here's my favorite of the whole set: Gothic wedding gown with tons of black beaded embroidery details.